Photographer I.C. 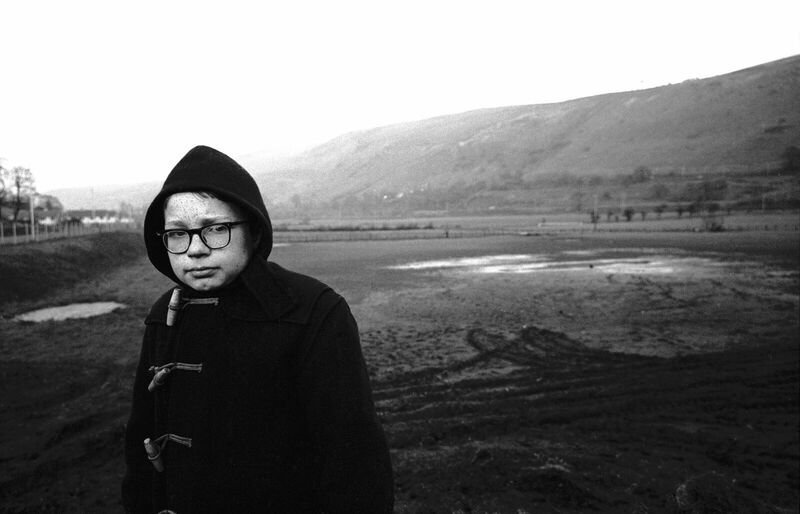 Rapoport shares this story behind this image of Ronnie Davies in the Aberfan: The Days After exhibition here at The National Library of Wales. “This is RONNIE DAVIES. I met Ronnie while wandering the streets of Aberfan a month or so after the disaster. He was walking his dog, alone and I stopped him to have a chat. He told me that his brother died in the Junior School. He had just began going to the Senior School down the street and though it suffered damage, no one was killed in that school – only some, like John Collins’ boy Raymond, were killed for being outside on the street or on retaining walls. Ronnie tearfully told me how much he missed his little brother – a brother he loved and cared for and ‘protected’. But he couldn’t save him from the big slide. The young boy was crushed in his classroom. Ronnie asked me why his brother died and he lived. He was confused about it and suffered terribly from survivor’s guilt. All I could say at the time was perhaps God had a plan for Ronnie Davies, that he’d been spared to carry on and do good things. Be a good man. Make his brother proud. Then Ronnie left the front room and disappeared to the rear of the home and when he emerged he was carrying a table game. A game that I had given him on Christmas Day, my very last day in Aberfan. He kept it all those years in perfect condition, a symbol of the encouragement I had given him and the hope to carry on. Aberfan: The Days After exhibition, containing I. C. Rapoport’s photographs, is on display at The National Library of Wales until 14 January 2017.